The project’s objective is to implement a series of initiatives to safeguard the habitats within the Capo Carbonara PMA that are listed as priority habitats under Directive 92/43/EEC. The project has therefore a European scope and its added value lies in the fact that it implements EU law and guidelines. 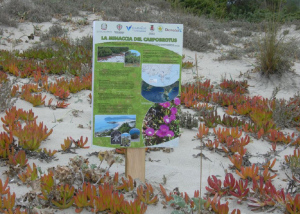 The project will carry out practical conservation activities in Nature 2000 sites and regarding Habitats of Community Interest, following the requirements of the Habitat Directive for multi-level and multi-disciplinary integration (our partnership is a good example of this), wide participation (meetings with stakeholders) and a knowledge-based approach. Our project applies two core principles of EU environmental policy, the prevention principle and the principle of action based on scientific data, contained in the Amsterdam Treaty and in the project of European Constitutional Treaty reform. The project implements Article 4.2 and Annex II.1 of the EU Regulations LIFE+, which state that one of the specific objectives of LIFE+ Nature and Biodiversity is “to support the further development and implementation of the Natura 2000 network”. In particular, the project is linked to the third strategic objective of Horizon 2020, which aims to take on the greatest global challenges with reference to climate change. 2007.2.1.2.1. – Assessing the ecological status of water bodies. Further value added will develop from the exchanges with other LIFE+ initiatives on similar habitats of Nature 2000 sites, which will enable wider dissemination of our results and methodologies for the safeguard of Community Interest habitats, and will also facilitate partnerships and links among citizens of various European countries. This explains why we believe our project has very high European value. Should this project not happen, habitats will continue to decline, a number of practical implementations of EU environmental law would not take place at a local level, and we will have missed an opportunity to raise awareness among local citizens and tourists on the importance of these habitats, leaving them open to further damage.